Shopping for DC Comics Vinyl Figures? This limited edition assortment of 2.75" figures includes eye-popping color variants of all 10 female Super Heroes and Super-Villains from Series 2, including Wonder Woman, Harley Quinn,Supergirl, and Lois Lane. Plus, the set includes two rare "Noir" variants (1:72) of figures from Series 1, bringing the total numbers of unique figures to 12! Each explosively adorable figure comes packaged in Cryptozoic's signatureblind-reveal tin. 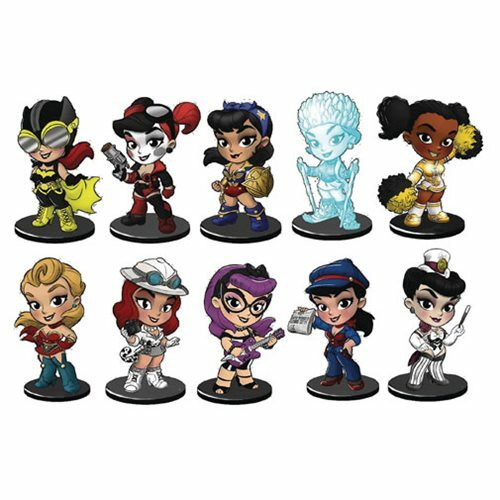 The DC Lil Bombshells Mini Vinyl Figure Series 2.5 Case contains 12 individually blind-packaged tins.